A popular pack the ODYSSEY PC625 Pure Lead TPT (thin plate technology ) gives this battery a superb power/weight ratio (watts per kilogram) Exceptionally good anti-vibration properties with fast recharge capability and recovery from heavy discharge. A popular pack the ODYSSEY PC625 Pure Lead TPT (thin plate technology ) gives this battery a superb power/weight ratio (watts per kilogram) Exceptionally good anti-vibration properties with fast recharge capability and recovery from heavy discharge. Can be mounted upright or flat. Design life of 8-10 years. Able to handle the shock and vibration found in Jet Skis and Quad Bikes it can operate in any orientation. ( although fully inverted is not recommended ) Typically used in the Ultima supercar, it is perfect for use in Lotus 7 inspired cars such as the Caterham and Westfield particularly those using motorbike engines. Odyssey batteries hold up to twice the overall power of conventional batteries, doing double the duty, therefore giving double the performance. The Odyssey Extreme Series available from Powervamp offer both enormous cranking power and deep cycle reserve power, giving you the best of both worlds. Even at very low temperatures, Odyssey Extreme batteries have the power to provide engine cranking pulses in excess of 2250 amps for 5 seconds – double to triple that of equally sized batteries on the market. With the ability to handle 400 charge-discharge cycles, they are as robust as they are reliable. The Odyssey Extreme Series are made with flat plates made of 99.99% pure lead, not lead alloy. This additional purity allows for thinner plates, meaning each battery can hold more at a time, thus providing the plate surface area required for additional power. That's how Odyssey Extreme batteries produce twice as much power as conventional batteries. Odyssey Extreme Batteries don't just hold more power, they're also designed to last up to 3 times as long as conventional batteries. 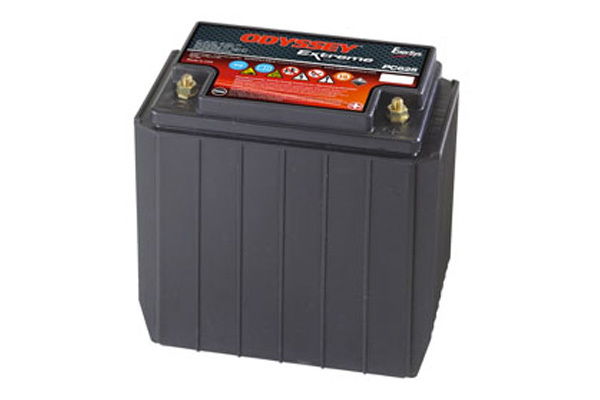 Odyssey Extreme Batteries have an 8-12 year design life and a 3-10 year service life. There are currently no optional extras available for this product.